A film-maker and author accused of possessing illegal weapons had a home "festooned" with swords and fake guns, the Old Bailey has heard. 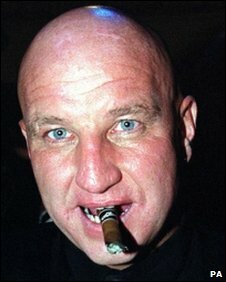 Dave Courtney was charged by police after assessors visited his Castle Camelot-themed home in south-east London when he was declared bankrupt. They called police, who allegedly found three banned weapons - a blank-firing revolver and gas cartridge firing guns. Mr Courtney, 50, of Plumstead, denies all three offences. He told the court that the three weapons found, including one sprayed gold for a James-Bond theme, were part of the stock for his wife's theatre props company. He said that neither of them had realised the two air-cartridge pistols and one blank-firing revolver were prohibited weapons. When asked who owned the guns, Mr Courtney told the court: "My wife does. She owns a lot more guns. They are all hers." Paul Cavin, prosecuting, said of the "extraordinary" property: "It is fair to state that there is more than a little element of castles and King Arthur. "Festooned around the house and walls in various rooms are a collection of weapons." "The Crown does not say this was the Plumstead equivalent of the Woolwich Arsenal, but the law says you cannot have them in your possession," Mr Cavin said. The former presenter blamed the police for his bankruptcy earlier this year, claiming his arrests had damaged his celebrity status. The Old Bailey was told that it was as a result of the auditors men searching for assets at the property that police were alerted. The defendant said: "The police keep arresting me for things, but I am no longer a naughty man." Mr Courtney ran a firm hiring minders to people in the news. He also produced and starred in his own film, which featured in the Cannes film festival in 2001, and told the court he had written nine books.